Two solo exhibitions of selected work by Swedish artist Lina Selander and Korean artist and film-maker Park Chan-kyong, juxtaposed for the first time. The project is curated by Binna Choi and Lisa Rosendahl, initiators along with Grant Watson of Practice International. 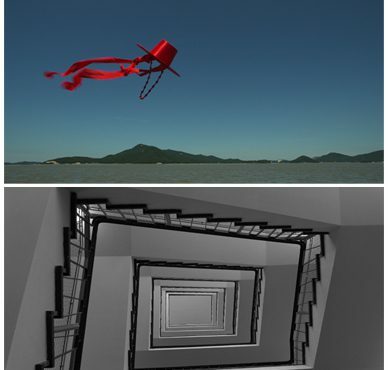 From top: Park Chan-kyong, Sindoan, 2007, film still and Lina Selander, Silphium, 2014, film still. Iniva is delighted to present two solo exhibitions of selected work by Swedish artist Lina Selander and Korean artist and film-maker Park Chan-kyong, juxtaposed for the first time, from 14 January to 21 March 2015, at Rivington Place. The exhibition is curated by Binna Choi and Lisa Rosendahl, initiators along with Grant Watson of Practice International, an EU-Culture–funded research project exploring what internationalism might be, based on practices of trans-national ethics and politics and the legacy of various colonial periods in the context of contemporary art. The exhibition is the second public showing of work presented by Iniva as part of this project. Park Chan-kyong and Lina Selander will show work through two solo presentations alongside each other, bringing together synergies within the artists’ practices. Both artists move between documentary forms and the structure of the visual essay as a way to investigate the construction of collective imaginations. In recent works they have explored different manifestations of the utopian aspirations of modernity, political trauma and the role that image-making and the media of film and photography have played in the development of modern society through presentation, depictions, visual control and surveillance. This first solo presentation of works by South Korean artist Park Chan-kyong presents a series of his latest film and documentary works that offers a new perspective on folk religious practices such as shamanism and utopian religious communities, from the period of colonisation and the cold war to the present time. By deepening his focus on the division of Korea into South and North – and the ensuing cold war politics as a dominant societal structure – Park’s latest enquiry into the practice of shamanism in the so-called “post-secular” time, reconfigures a way in which art and cultural practice, especially in the non-western context of what he terms the “rootlessness” of its artistic genealogy, engages with political trauma and the repressed. A central work in the exhibition is Sindoan (2007), a ‘fantasy-documentary’ that marks a point of transition for Park’s focus on political structure to religious subjects. The title of the work refers to the name of a mountainous area where divergent religious communities established their bases when Korea was occupied by Japan at the turn of the last century. Widely different religions, including shamanism, Confucianism, and Protestantism co-existed in this place for decades under the Gyeryong Mountain. The history of ‘Sindoan’ as presented in the film, tells the history of various forms of oppression, and despite of all these of surviving beliefs, they practice ways of co-existence between human beings and the (super)natural throughout the time of dictatorship and the persisting cold war condition. The exhibition is contextualised by the presentation of various materials that punctuate Park’s research trajectories, and as a consequence highlight his practice not only as an artist but also as an activist, writer and curator. “I am never sure whether I invent or dream. Rebuilding, excavating the inaccessible chamber from which the desired images will appear, but different.” Extract from Silphium, Lina Selander, 2014. This exhibition comprises three recent films by Selander together with a selection of materials from the artist’s working archive. Characteristic of Selander’s work is the use of film to build dense layers of images and meaning, through which contemporary society is connected with history and the pre-historic. At the core of her enquiry lies a continuous questioning of the concept and materiality of the image. Selander’s work repeatedly asks us to reconsider the status of the image – as representation, memory, object, imprint or surface – and our relationship to it. Silphium (made with Oscar Mangione, 2014) begins by telling the story of the ancient plant Silphium and the connection between the fate of the now extinct plant and the Greek colony Cyrene. The story serves as an entry point into an open-ended visual journey. In the film, methods of power and their symbolic representation are put into question through moments of vulnerability and the loss of visual control. Model of Continuation (2013) is based on the invisible core of the visible inscription; the image as an interior object and its relationship to seeing and reproduction technologies. A camera is disassembled in a studio in front of another camera whose images are then projected in the same studio, and re-filmed. The film stages a circular encounter between experience and technology, which interferes with that which the camera does not contain: the images. Anteroom of the Real (2011) takes its starting point in the deserted town of Pripyat, located within the zone of the Chernobyl nuclear disaster. A pair of hands flip slowly through a pile of photographs comprising: images of a model of reactor 4, buildings in Pripyat, books in deserted offices, trashed interiors, pictures of a TV monitor showing a documentary about Chernobyl. As the timelines of the still and moving images intersect, the film raises questions about what an editing room is and can be, and about narrativity, time and images.